Not quite Blockbuster and not quite Redbox, 7-Eleven’s brief flirtation with a movie and VCR rental service in 1986 and 1987 was a weird sort of future vision that was a little too ahead of its time. MovieQuik (later RentaMovie) broke new ground by offering 24-hour rentals and no membership fees. The catch was that you weren’t in a video store, you were in a convenience store that had a small section carved out for movie rentals, so your selection was limited. Each location had about 200 titles in stock. The rates were decent – $0.99/day for movie rentals and $4.99/day for VCR rentals. A few locations also offered Nintendo game rentals. Rent tracking and availability was handled through a centralized computer network located in Canada, which is pretty impressive for pre-internet times! Ultimately, though, you kind of want a bigger selection than just 200 titles? But tapes are bulky and tapes are expensive and keeping up with restocks and regional preferences and the shipping logistics involved with both made it an expensive add-on service, so the company behind Moviequik went under. Not a huge loss, as Blockbuster was usually right down the street. 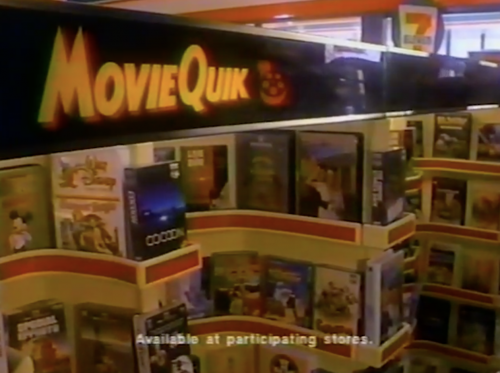 Redbox would take this idea and economize it in the 21st century, when the media was smaller and lighter and the logistics of nationwide shipping became more economical, but let’s give MovieQuik its props for its ambitious moment in the spotlight. Let’s…Thank Heaven…if you will.